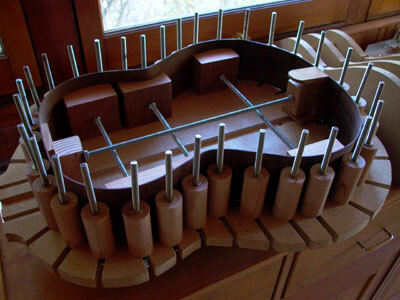 The body of the guitar is made up of the Top, the Back and the Rim. 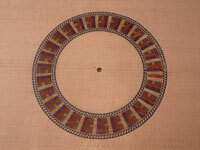 The Rim is made from two symmetric pieces of thin wood, called the Sides. These are usually from the same wood as the Back. Before building the Body, the main components must be brought to the correct thickness. The thickness is determined by a tradeoff between strength, weight and acoustical behavior. The Body needs to be as thin and light as possible and yet strong enough to hold up to the force of the combined tension of all strings. And it must be flexible enough to resonate with the vibration energy from the plucked strings which couples with the air inside the body and creates the sound waves coming out of the soundhole. In a nutshell, this is what the sound of the instrument is all about. 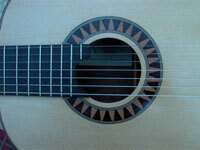 The wood that is sold by luthier supply companies for Tops, Backs and Sides is quarter-sawn and 'book-matched", i.e. the pieces were next to each other in the block of wood when sawn and are usually almost identical in appearance. When glued together to make the top or the bottom the two book-matched pieces are therefore very close to symmetrical to the centerline. The first operation in building the body is the so-called thicknessing of the top, bottom and sides. I do this with a wide-belt thickness sander to a uniform thickness of 2-2.5mm. 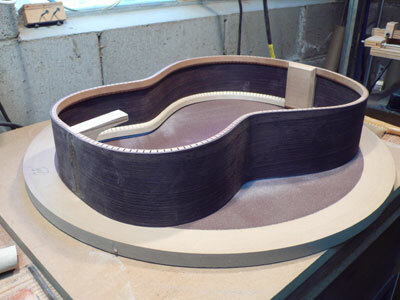 To make the Rim the two Side pieces need to be bent to the form of the guitar. This is done in a bending machine where the moistened side wood is "cooked" between two pieces of stainless steel sheet metal which are heated by an electric heating blanket. 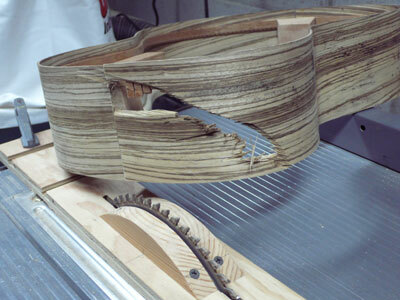 The shape is provided by a mold in the shape of half the guitar into which the wet and hot sides are pressed and left to cool. 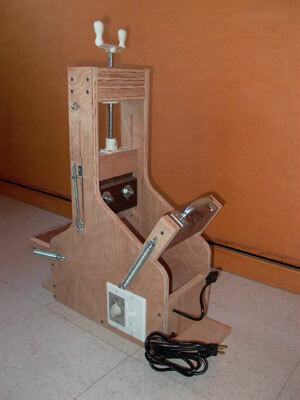 This machine was invented and pioneered by Charles Fox, and my design is a copy of the Charles Fox Wood Bending Machine. I built this Universal Mold fixture to define the shape of the Body and to glue on the Top and the Back. It is adaptable to different body sizes and shapes and is another credit to my teacher Charles Fox. After the two Side pieces are bent they are positioned in the fixture, marked and cut at the center line. Then the Head Piece and Tail Piece are glued in and clamped. In preparation for the kerfing strips to be glued to the top and bottom edges of the Rim they need to be bent to conform to the shape of the Rim. This is best done with steam from a normal kettle. They are then clamped to a form to cool. 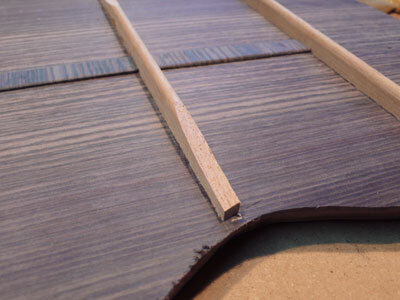 The kerfing strips are very floppy and need to be handled with care to keep them from breaking. 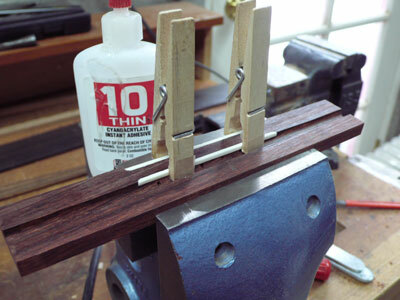 Before gluing them to the Rim I clamp them to the Rim with clothes pins and cut them to the correct length. Then I support them on a form, apply the glue with a roller and carefully clamp them to the rim in the correct position starting from the Head Piece. The glued-up Rim is quite stiff and is then sanded in spherical dishes to define the exact surface to the Top and the Back. Oops! Shop accidents do happen. This one was rather spectacular. Sad for the beautiful Zebrawood! 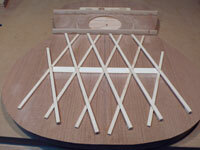 The Back gets three cross braces and a center reinforcing strip. The cross braces are near-triangular in cross section and scalloped (thinned with a chisel) about 2 in. from the rim. The center reinforcing strip is made from the same wood as the Back but with the grain orientation perpendicular to the Back. 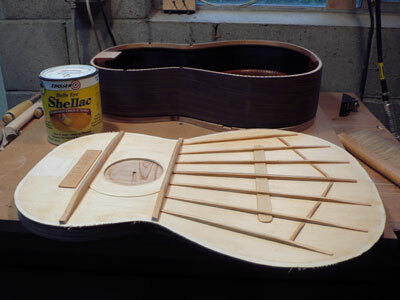 To assemble the Back bracings I use a concave mold that has the intended spherical radius of the Back (12 ft. for my guitars). 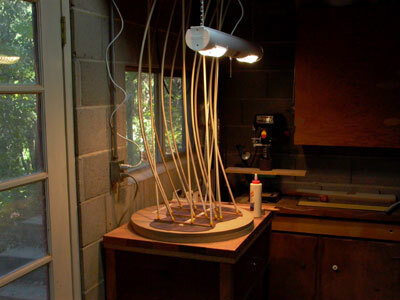 The components are pressed into the mold for gluing using so-called go-bar sticks. This is a very old, simple and practical method. 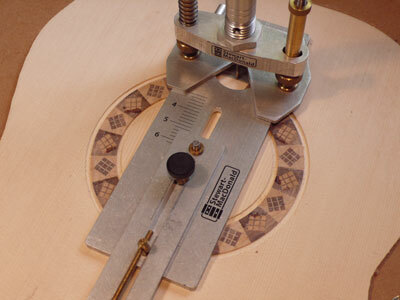 The Rosette is inlaid into the Top. It can either be a purchased component or custom-made. Below are three examples of custom Rosettes that I made. 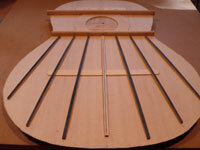 Bracing the Top is the most essential step in making the guitar into a musical instrument. 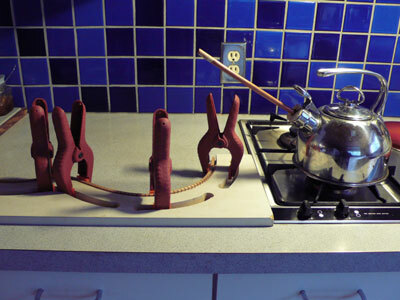 There are a number of bracing methods that I have experimented with. 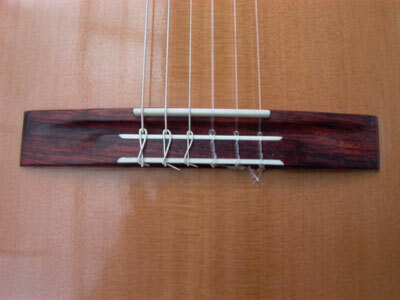 The V-bracing shown in this picture is very common for Classical Guitars, and there are many V-bracing styles used. I have also developed a method of what is called lattice bracing as shown below. On some bracings I use thin (0.01 in./0.25mm) carbon-fiber reinforcements that are either laminated vertically in the center of bracing strips or on top of them. 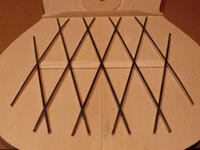 Their main function is to prevent long-term creepage of the Top under the tension of the strings. The process used here is the same as for the Back. 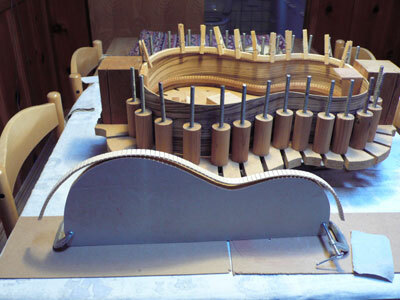 The braces and the Top are pressed into a spherical form using go-bar sticks for gluing. 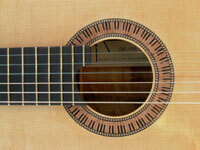 The Classical Guitar Bridge is quite rigorously defined in length, width and height. Also, the way the strings are tied to is is very traditional. The inlay and the saddle are bone. Because the Bridge will be glued to the Top which is domed it needs to have a concave bottom to fit the dome. 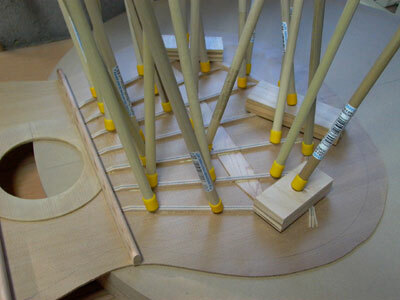 The slots on the Bridge are made with a router, and the bone inlay pieces are fitted and then glued using superglue.